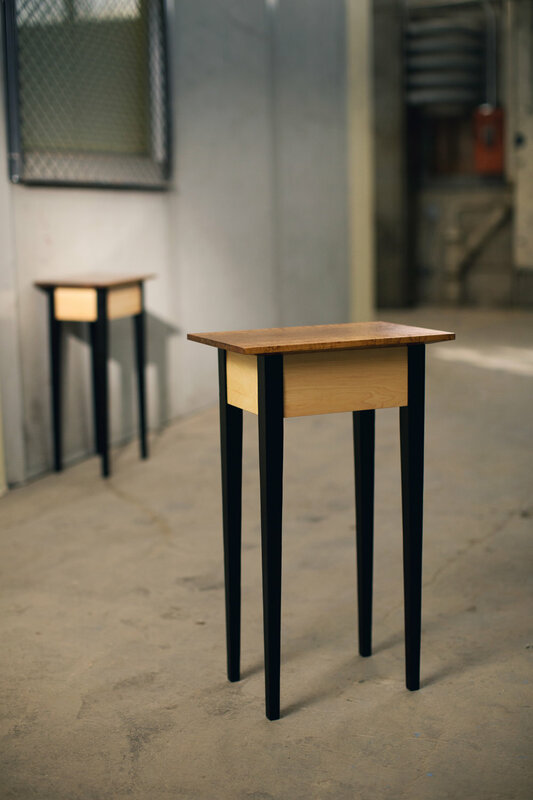 These two nightstands, meant to always be a matched pair, are a study in continuous grain. The tops, made from a single piece of figured birdseye maple, are finished using techniques traditionally applied to fine gun stocks which brings out the character and natural chatoyance of the wood and highlights the way the grain flows between the two. The ash legs are carefully sawn out of a single slab and then charred in the Japanese tradition of shou sugi ban, leaving only the subtle, vertical lines of grain visible. The gentle, wide grain of the clear maple wraps around the bodies of each table and hides the drawer within. The hand-cut joinery gives a strength to these delicate tables that will allow them to continue standing side by side for many years to come.